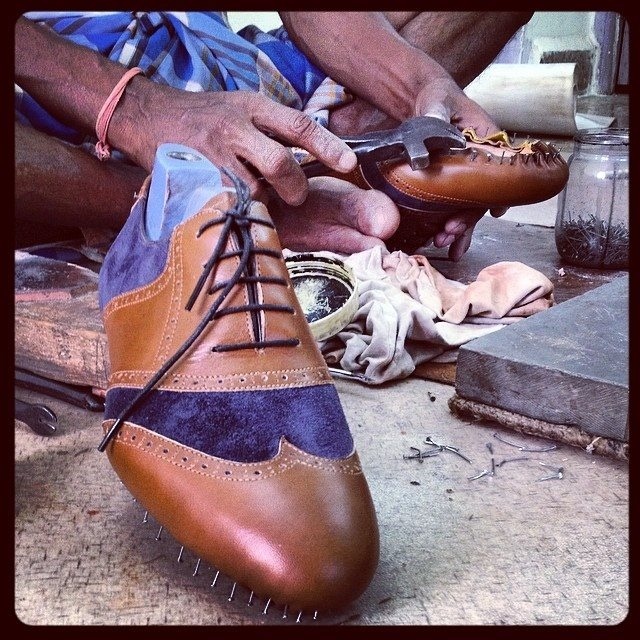 The reason this particular niche market caught my attention was the mention of the 150 year old handmade-to-measure shoes maker John Lobb entering India with its shoes priced at 6 lakhs. They make their entry with a special By Request Inaugural Event the last weekend of this month in Bombay and in Delhi. Anything handmade-to-measure must also definitely have a presence in India, so intrigued I asked around for comparables on local shores. 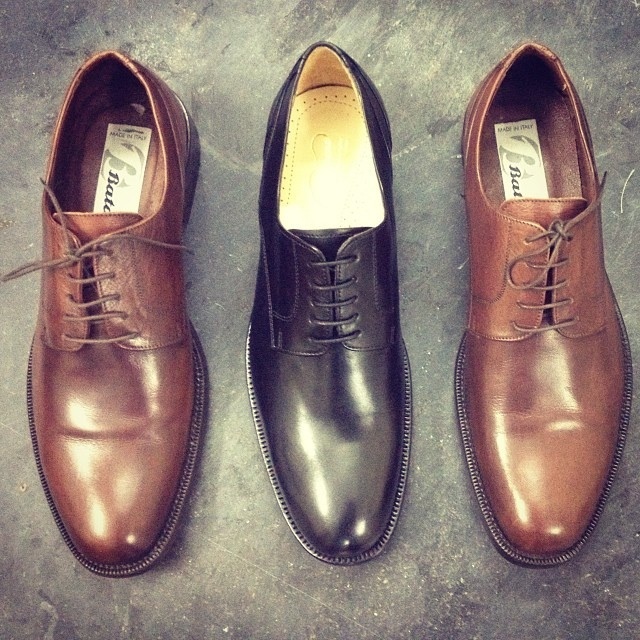 Though I couldn’t find any maker with such a long history in luxury (John Lobb’s 140 years nor be dismissed) I did find one up and coming brand of handcrafted mens shoes based out of my hometown no less. And that’s how a me (with a sceptical brother in tow) ended up at the workshop of the mens accessories brand Cuero. 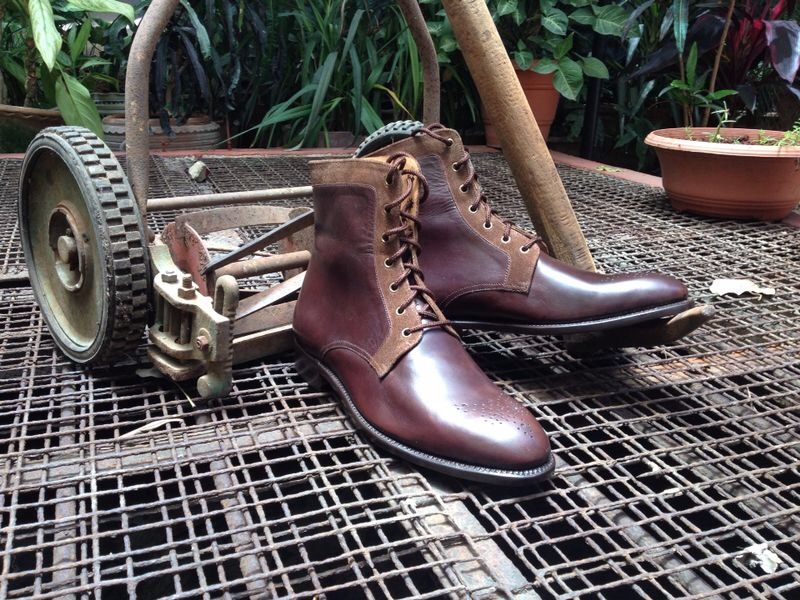 Firstly if you are wondering what Cuero is-the brand name means “leather”in Spanish. I entered the “workshop” in a lovely sleepy little bunglow in the outskirts of Pune and I was charmed. I walked in to see about a dozen workers hard at work. While one was using glass (yes, glass) to scrape and get an even finish on the shoe-the other one was using actual goat horn to to give a shine to the sole. 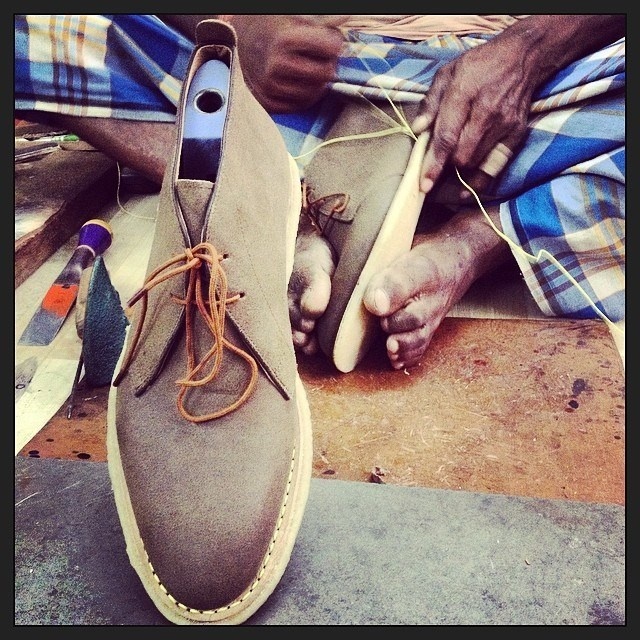 Completely intrigued I asked Naman what a bespoke shoe for men was all about. Turns out a typical handmade shoe (for it to be classified as bespoke) would involve 200 processes which would be common to the shoe wherever it was made on the world. This involves processes that one would assume would be typical to the handmade shoe-for eg a detailed discussion with the client about what kind of shoe, his personal preferences (according to him most celebrity clients ask for a heel inside the shoe to make them look a few inches taller discreetly :-)) deciding the design, feet measurement and tracing the outline and also the instep and heel measurement. Apparently for most of us- the left and right foot are different in their measurements. Then the pattern and the design are made and actual work on the shoe starts. 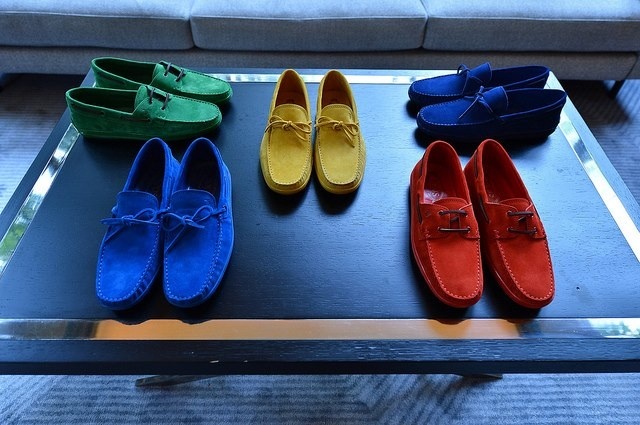 Naman’ passion for the perfect quality shoe had both me and my brother hooked. And my brother who has been in NY for the past 15 years, is in the hospitality industry and always gets his suits and shoes made to order gave an order right away for a pair of handmade mens shoes. This season boots are worn below formal suits and are all the rage with the trendy and hip New Yorkers. 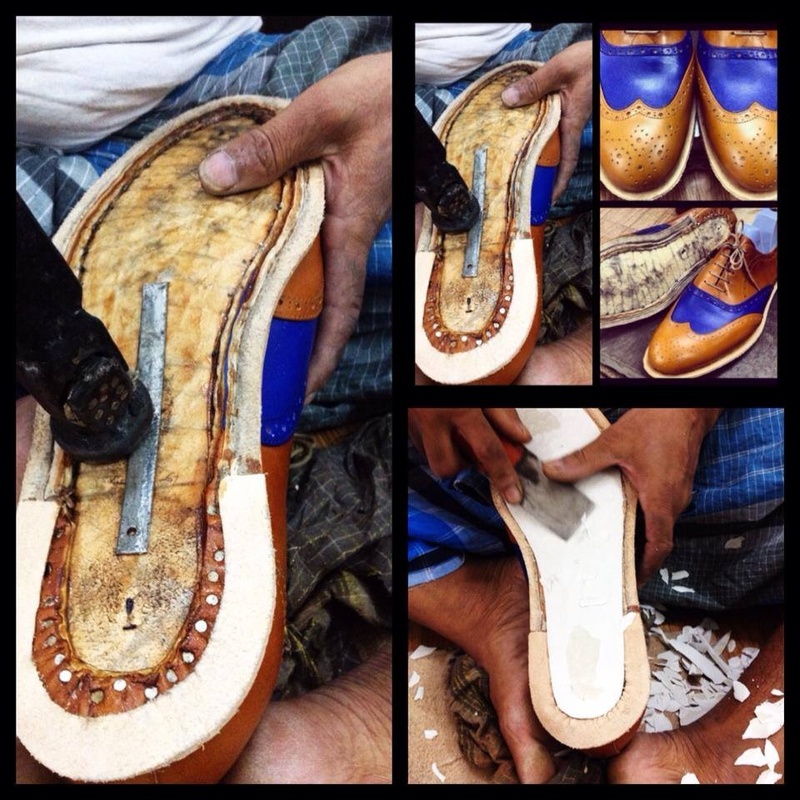 A typical pair of shoes takes about 3-4 weeks to make and Naman keeps his clients up to speed with regular SMS updates and pictures via Whatsapp of the shoe “under construction”. Among the more unusual and fascinating processes (which I discovered during these updates) is usage of a small steel plate in the sole for balancing the shoe, filling the sole with cork for the special welted sole and actual ironing of the shoe to remove wrinkles on the shoe. The shoe is also kept for almost a week in the mold to make sure that the leather molds to the shape of the foot and that it fits the wearer perfectly. Naman’s clientele includes Bollywood celebrities, international royalty (the cover picture features Lord Lamont of Scotland) as well as the well travelled clientele who insist on the perfect custom made experience. 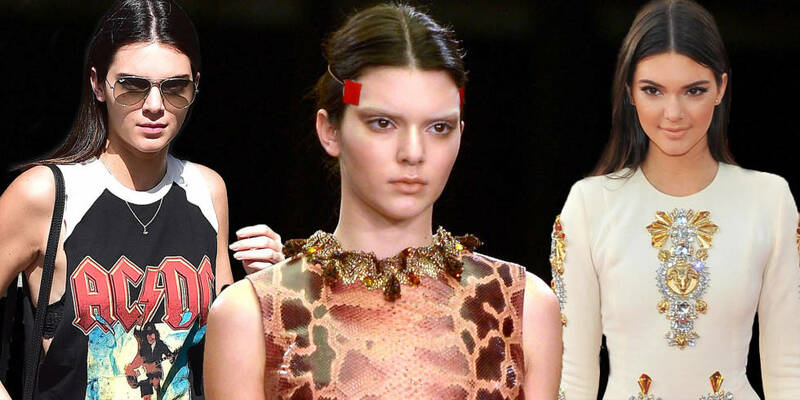 As we go to press, he was super excited at Cuero’s debut at the Fashion Week this month. Check out Cuero’s FB page to view Naman’s labours of love or call me to help convince him to make you one of his very special limited edition shoes. Caitlyn Jenner Is Breathtaking in Glamorous White Wrap Dress at the 2015 ESPY Awards—See the Pics!